The long-standing romance between India and Russia seems very much alive as Vladimir Putin's one-day summit in Delhi commences on Thursday. "If you look at the history between the two countries, I would go as far to say Russia remains India's best friend amongst all the great powers," said John Lee, adjunct associate professor at the University of Sydney. The two nations enjoyed a heady courtship during the 1970s, but the relationship has faded over the years. Five years ago, Russia-India trade was one-fifth of Russia-China trade, but as China becomes increasingly assertive in Asia, that ratio fell to one-tenth in 2014. In what is becoming a signature move on Modi's global charm offensive, the Indian leader posted a series of tweets in Russian upon Putin's arrival. During a visit to Japan earlier this year, Modi also tweeted in Japanese . "Times have changed, our friendship has not. Now, we want to take this relationship to the next level and this visit is a step in that direction," Modi's tweet said. Military deals are expected to steal the show, as India remains a major client of Russian arms. Roughly 75 percent of India's weapon imports come from Russia, according to the Stockholm International Peace Research Institute. Read More Ron Paul: A new Cold War with Russia? "Russia has been a traditional supplier to India but they have slid away a bit in the face of competition with the U.S. and Israel. Still, the Indians are dependent upon them for spare parts for their existing equipment," said Thomas Pickering, vice chairman of Hills & Company and former U.S. ambassador to India and Russia. India is set to finalize a purchase of 126 fighter airplanes from France' Dassault Aviation (Euronext Paris: AM-FR), but Pickering expects Putin will attempt to convince Modi to buy Russian hardware instead. Modi's agenda will primarily focus on energy, with state-run oil firms Essar Oil, ONGC Videsh and Oil India all expected to sign Memorandums of Understanding with Rosneft (Moscow Interbank Currency Exchange: ROSN1-MZ), Russia's largest oil producer, during Putin's visit. A gas pipeline between Russia and India may also be discussed as a long-term future possibility, but experts widely cautioned against the feasibility of such a project since the pipeline would have to cross China. "India certainly does not want to see a warm embrace between Russia and China given its own nervousness and concerns about China's military, so that's part of the geopolitics of the deal," Pickering said. The visit marks contrasting points in each nation's development paths. Russia faces a perfect storm amid international sanctions, a record-low currency, sinking oil prices, and global backlash against its involvement in the Ukraine conflict. Meanwhile, India is the current emerging market darling as investors cheer the central bank's successful fight against inflation and Modi's pro-business reform agenda. Read More Best hedge fund bet of 2014 is ... India? Putin hopes to walk away from this visit with as much as possible, Pickering said. "He's the skunk of the international garden party these days...if he can bring off something with India, however small, it will be recognition of the fact that he isn't totally banned by the rest of the international community that he can't move around." India has the upper hand in this relationship, others said. "India is playing a game of opportunistic alliances. As Russia's Ambassador to India, Alexander Kadakin, rightly said in an interview on Monday: India is like a rich fiancée with many bridegrooms," stated Anil Gupta, professor of strategy, globalization and entrepreneurship at the University of Maryland. 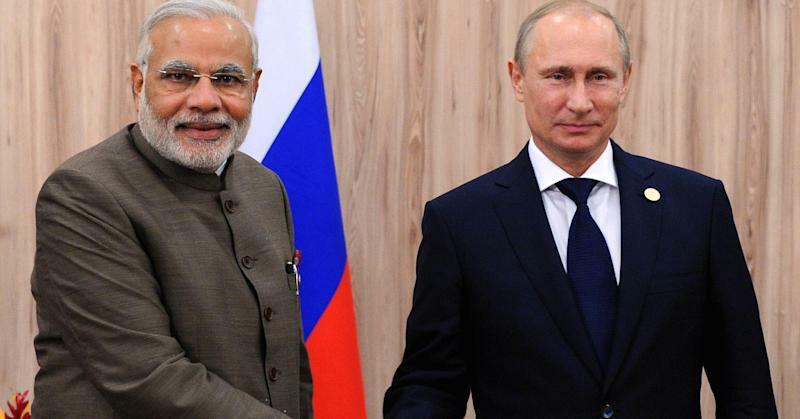 "Ten years from now, Russia is unlikely to be a particularly important country for India. India would be the world's 3rd largest economy at that time (and much larger than Russia). By then, India is also likely to have overcome its weaknesses in defense. However, Modi has concluded that a strategy of opportunistic alliances is the best strategy to achieve that goal as rapidly as possible," Gupta added. Ron Paul: A new Cold War with Russia?